Pfc Cannoneer, Btry A, 462d P.F.A.Bn. One bizarre incident of the Corregidor campaign remains as a unique and eerie mystery. Whereas all those missing in action from the 503d Infantry are accounted for and their deaths confirmed by witnesses, the single missing in action report of the 462d Parachute Field Artillery Battalion indicates that Cannoneer Harvey R. Huskey of Battery A was never seen again after he parachuted from his plane onto Corregidor. The assaulting paratroopers turned every rock and pebble on the Rock at least twice in their relentless search for the enemy. Yet the remains of this artillery man were never discovered. He did not drift into the sea; PT boats were watching and would have seen him. Was his body disposed of by the enemy? Did he seek shelter in an enemy occupied cave and was killed the morning of the jump? Was he captured alive and tortured to death in an enemy abyss? The 462d also failed to locate three .50-caliber machine guns and one entire 75mm pack howitzer that were dropped onto Corregidor on 16 February. Huskey was not included in Templeman's jump list, but in view of the manner in which Templeman's list was compiled, this means nothing. Recent research by Jim Mullaney, based upon the fact that Huskey is nowhere listed in records of the U.S.WWII M.I.A. 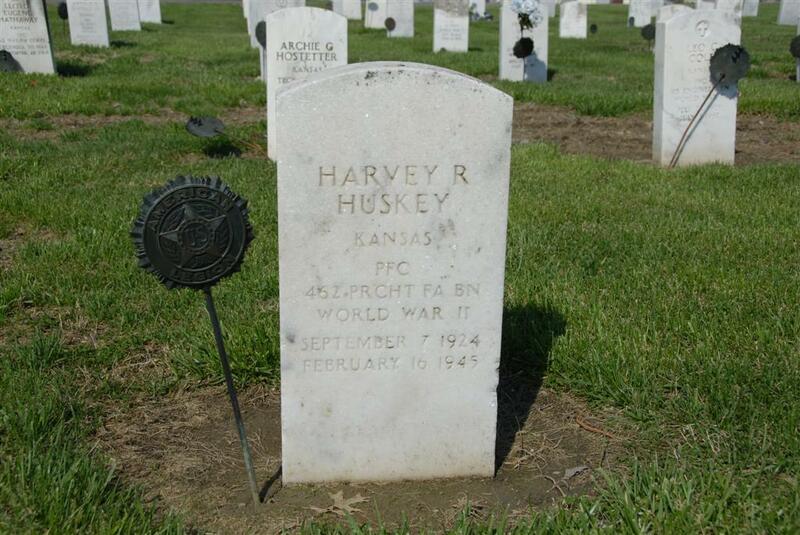 's, indicates that there was a "Harvey Huskey" buried in the HIGHLAND CEMETERY in Allen County, Kansas. Burial date was October 25th 1949. Jim comments that "The date of burial fits in the time slot that so many WWII KIAs bodies were being returned. There is a Harvey Huskey listed in the Allen County records as KIA." Harvey Huskey's final resting place. Image has been provided courtesy of Todd Mayer. The 503d PRCT Heritage Battalion is privately supported through membership fees, PX Sales and donations made by like-minded private individuals who believe in the 503d Lineage and Heritage. Support us. Make sure we're here the next time you are.